While the elbow seems like a simple joint, there are several muscles that attach to it. The two main muscle groups are your wrist flexors and wrist extensors. These attach through tendons to bony areas called epicondyles. The term “epicondylitis” refers to the muscle and tendon irritation with possible inflammation at these areas. Put more simply, it means that they are being overused! This could be from playing racquet sports, golf, cooking, cleaning, painting, or even computer work. In sports like tennis and golf, injury can be caused by a grip size that is not fitted properly, over rotated wrist positions, or swing mechanics that put the elbow and wrist in stressful positions. Lateral epicondylitis (“tennis elbow”) is wrist extensor pain that starts on the outer elbow and radiates along the forearm. Pain usually increases with bringing your hand back and turning your palm up. 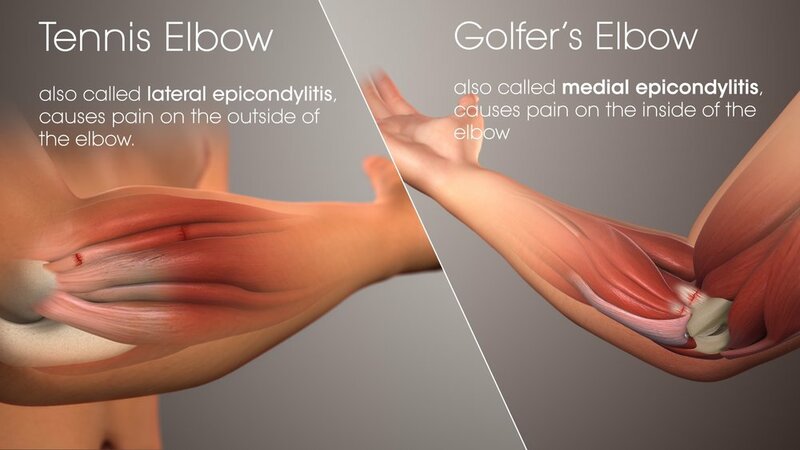 The opposite is true for medial epicondylitis (aka “golfer’s elbow”) affecting your wrist flexors. Pain usually starts along the inner elbow and goes down the inner forearm when you bring your hand forward and turn your palm down. With both injuries, people feel a tugging sensation at their elbow, pain and weakness with gripping, and that they have less control over their racquet/club. If you feel numbness and tingling, it may be related to nerve irritation through the same muscles around your elbow. Since these injuries stem from overuse, the first step is reducing your activity – the body needs time to rest and recuperate. The next step is trying physical therapy. At Core Performance PT, our goal is to meet you where you are, figure out what’s contributing to your pain, and develop a plan with you to get back on course. Our treatment approach includes manual therapy, instrument assisted soft tissue mobilizations, stretches, upper extremity strengthening, and retraining body mechanics. Elbow compression braces are also helpful to reduce pain, but proper exercise can help you regain flexibility, strength, and long-term improvement. 1. Wrist stretches: hold each position for 30 seconds, repeat 2-3 times. 2. Wrist eccentrics: perform 2-3 sets of 10 reps per exercise. 3. Eccentric pronation and supination with Twist Bar: perform 2-3 sets of 10 reps. Need video instructions? Check out our Instagram or Facebook pages for more help with performing these exercises. Our exercise app CoreEX is also available to assist you in your exercise routine. You can download it on iPhone and Android today!